Comfort and style with together in this contemporary chair and ottoman set. Each cushion is filled with luxury high-density foam for a comfortable and resilient feel while you kick your feet up and relax on this set. 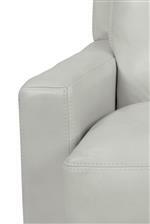 The slender track arms, defined back and block feet create a defined silhouette complemented by plush boxed cushions. 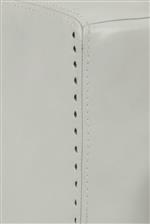 For added detail, nailhead trim lines the outside arm. Add this set to your home collection and it will quickly become your favorite spot to relax. The Latitudes-Blake Contemporary Chair and Ottoman with Removable Seat and Back Cushions by Flexsteel at A1 Furniture & Mattress in the Madison, WI area. Product availability may vary. Contact us for the most current availability on this product. 1369-08 Ottoman 1 24" 22" 15"
1369-10 Chair 1 33" 40" 33"
Padding & Ergonomics Luxury cushions consist of 1.8 lb density polyurethane foam core topped with 1.2 lb recovery foam and fiber wrap. Simple in design with modern elements, this collection will enrich your home with the fresh look you've been after all along. Each frame boasts a clean profile accentuated by large, plush boxed cushions, narrow track arms and a low profile back covered by loose-pillow back cushions. The short block legs and narrowly-spaced nailhead trim along the outside of the arm rests provide intriguing details authentic to contemporary style. Featuring innovative design elements, each cushion is filled with luxury high-density foam that will hold shape and Blue Steel Spring support that will provide durability for years to come. 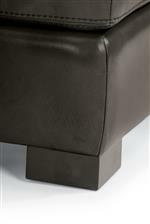 The Latitudes-Blake collection is a great option if you are looking for Contemporary furniture in the Madison, WI area. Browse other items in the Latitudes-Blake collection from A1 Furniture & Mattress in the Madison, WI area.